It is not uncommon for a dog to turn its nose up at a snack and often dogs can get hold of and eat things they shouldn’t. We’ve gathered a quick list of 5 top things to keep an eye out for to make sure your dog doesn’t get a chance to cause itself damage. Almost every dog owner is aware of the old saying that Chocolate is poisonous for dogs. This is true, chocolate contains a substance called theobromine, and the darker the chocolate, the higher the levels of theobromine. 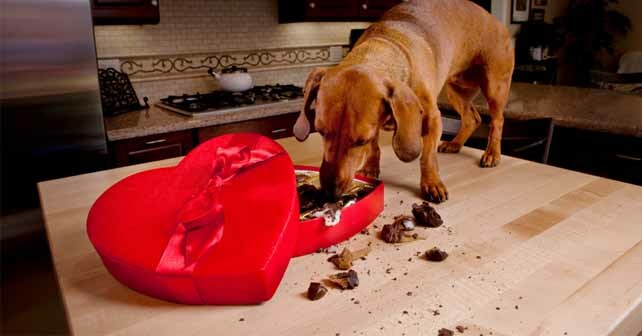 Many dogs will happily eat chocolate if offered, and you should make sure that they are never given any. If you think your dog may have consumed a large amount of chocolate that could potentially be detrimental to its health. Excessive consumption of chocolate can cause a dog to vomit so keep an eye out for continual thirst, lethargy and nausea. If in doubt, call your vet immediately. Chicken, providing it is just the meat without any bones whatsoever is perfectly fine to feed your dog. Chicken on the bone however, such as your left over chicken wings or legs should not be given to dogs simply because of how fragile the bones are. Chicken bones, and bones from other white meats such as turkey, splinter when broken and the sharp fragments can get jammed in the dogs mouth and throat. This can cause some serious complications to your dogs insides so make sure your dog has no access to any chicken scraps that are still part of the bone. If your dog appears to be continually thirsty, and you think he might have swallowed bits of chicken bone, call your vet and they should attempt to fit you in the same day. Grapes are actually highly toxic to dogs. Most dogs won’t be interested in consuming grapes, but some, particularly chancers who will eat absolutely anything, might try to eat grapes. Again, any lethargy after missing grapes or if you’ve fed them by accident, call for an emergency veterinary appointment. There might come a time when you unexpectedly run out of dog food and only have tins of cat food left, or you might have placed your cat’s food down only to have your dog barge in and eat it all. How harmful can it be right? The truth is that the nutritional requirements in the diets of cats and dogs couldn’t be more different. They both are considered carnivores, though dogs themselves have diets that are in fact more omnivorous which means they eat both meat based protein and vegetable matter in pretty much equal amounts. Cats require a high protein diet, something which if given to a dog can cause diarrhoea and upset to your dog’s stomach for some while. Unless you want considerably mess to clean up, you should avoid letting your dog consume cat food at as much as possible. Milk, specifically cow’s milk but also Goat’s milk and others, should not be fed to dogs. Humans are the only animals to actively consume the milk of another species and there are numerous arguments as to whether this is necessary. For dogs milk can cause an upset stomach and so should be avoided.